Hardcover, 9.5 x 13 in. / 260 pgs / 200 color. Text by Giuliana Scimé, Mariateresa Cerretelli, Franco Fontana. Italian photographer Maurizio Galimberti works exclusively in Polariod. His mosaics of square, white-bordered frames have captured personalities including Andres Serrano, Wim Wenders, Monica Bellucci and Sting, among many others, piece by piece. When he doesn't scratch designs onto the developing pictures with a stick or even a toothbrush, preemptively disrupting any sense that his work directly reflects the real, he takes hundreds of shots of the same subject and eventually assembles up to 140 in a single finished grid. His patrons have included Condé Nast, Rizzoli and Time, and, in advertising, Cartier, Rolex, Nokia, Fiat and Veuve Cliquot. This personal portfolio of the city of New York is full of clean-edged skyscrapers and bridges, limitless streets, multicolored signs, vivid people and limpid skies. 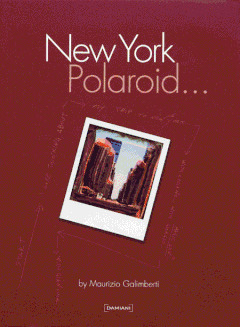 Galimberti's Big Apple is thoroughly deconstructed and reconstructed, and the resulting unreal city corresponds perfectly with the soul of New York. Edited by Federico Mininni. Foreword by Elliot Bernerd. Text by Maurizio Rebuzzini. FORMAT: Hardcover, 9.5 x 13 in. / 260 pgs / 200 color.